People sit a lot. Like ... a lot, a lot. Over the past hundred years, humans have gone from easily walking those 10,000 coveted steps every day to barely hitting 1,000 even with a Fitbit on their wrist. The tragic realization is that with all this sitting and the lack of walking, we've lost one of our prime assets: our bums. But not every bum is alike, and each comes with its own set of problems and perks. 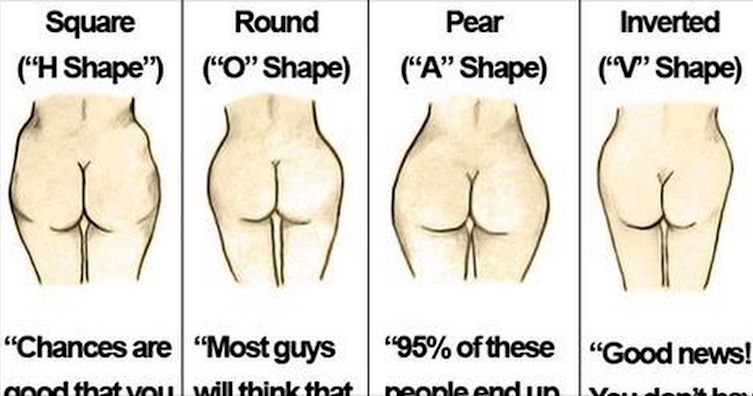 So read over this article, find out which category you fall into and bring back that booty! The square or "H"-shaped bum comes from either high hip bones or a bit of extra fat in the love handle region. This can make your derriere look flat rather than giving it the coveted round look. Unfortunately, it could take a lot of squats to get that curve. The round or "O"-shaped bum means there is more fat storage in the upper parts of your glutes. Luckily, this gives the bum a perky appearance, so it's pretty easy to get that curved shape with a few glute-strengthening moves. Just like the shape, the heart-shaped bum is usually fullest at the bottom and tapers out at the top. This can mean more fat is stored in the upper thighs. While this type of bum is one of the more coveted ones, as women age and lose estrogen, the fat that's stored around the glutes slowly but surely moves to the mid-section. This is the bum commonly seen in older women once they've started losing estrogen. As with the heart shape, the fat storage that used to be in the bum has moved to the abdomen or mid-section. Without hard work, this bum can be prone to sagging.